Jean-Paul Sartre is often seen as the quintessential public intellectual, but this was not always the case. Until the mid-1940s he was not so well-known, even in France. Then suddenly, in a very short period of time, Sartre became an intellectual celebrity. How can we explain this remarkable transformation? The Existentialist Moment retraces Sartres career and provides a compelling new explanation of his meteoric rise to fame. Baert takes the reader back to the confusing and traumatic period of the Second World War and its immediate aftermath and shows how the unique political and intellectual landscape in France at this time helped to propel Sartre and existentialist philosophy to the fore. The book also explores why, from the early 1960s onwards, in France and elsewhere, the interest in Sartre and existentialism eventually waned. The Existentialist Moment ends with a bold new theory for the study of intellectuals and a provocative challenge to the widespread belief that the public intellectual is a species now on the brink of extinction. "In a brilliant history of Sartre as philosopher and public figure, Patrick Baert creates a new theory of the public intellectual not through their personal intentions (the vocabulary of positioning) but in terms of the consequences of their thought (the vocabulary of efects). The result is a superb contribution both to our understanding of public intellectuals and to the sociology of knowledge." "Why Sartre emerged, from almost nowhere, to become one of the most compelling intellectuals of the 20th century has posed a seemingly intractable challenge for historians and social theorists alike. Patrick Baert cuts this Gordian knot, and develops a new sociological theory of intellectuals along the way. The Existentialist Moment is a deeply researched, conceptually compelling work." 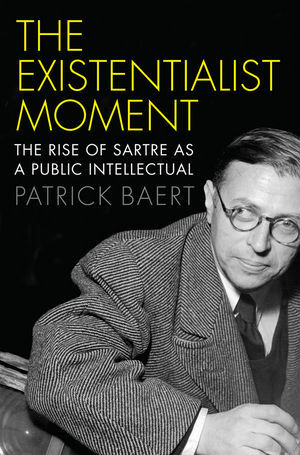 "Baert's The Existentialist Moment gives us a unique opportunity to see precisely what was going on in the French intellectual world in 1945 when Sartre first exploded on the scene. The interactions among French thinkers, against the backdrop of earlier struggles between collaborationists and the Resistance, are vividly portrayed in Baert's fine writing. There is nothing like this book on the market today. It is a gem."